Thought the ramen craze is over? Think again. There are new ramen houses popping all over the metro. 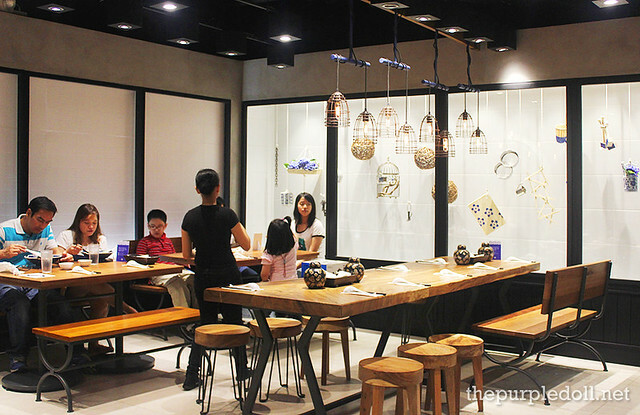 And for northies like me, good news for us as there's a fairly new ramen place worth trying out in Trinoma. It's called Hanamaruken Ramen which is actually quite popular in Japan, with locals religiously queuing at its 40 branches all over Osaka. 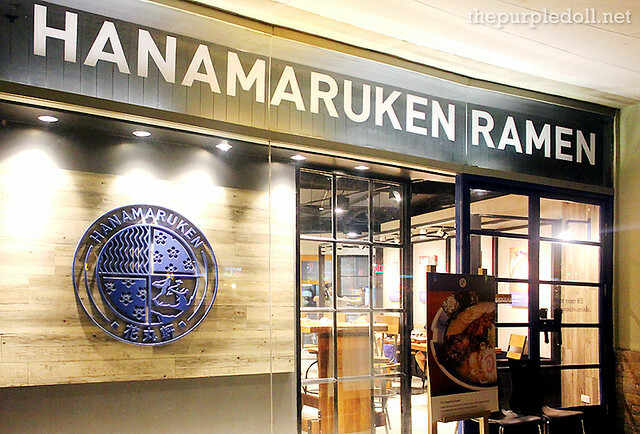 Located at the 2nd floor garden of Trinoma, Hanamaruken Ramen is a new ramen joint which opened some time in late 2013. At first, I wasn't sure if it's worth trying out since there have been a lot of ramen houses opening last year. This might just be another ramen place not worth the hype, or so I thought. However, I eventually told myself, "Hello? 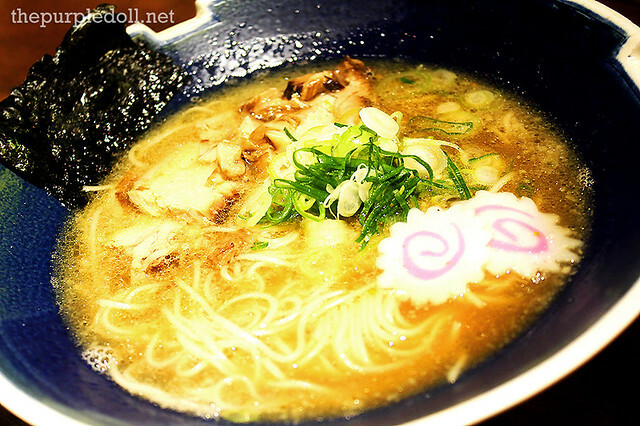 If Osaka locals line up to have a taste of their ramen, then it must be good!" So one fine weekend a few months ago, the beau and I together with two of our friends, went in to Hanamaruken Ramen to have a double ramen dinner date. I honestly didn't have any expectations going in. 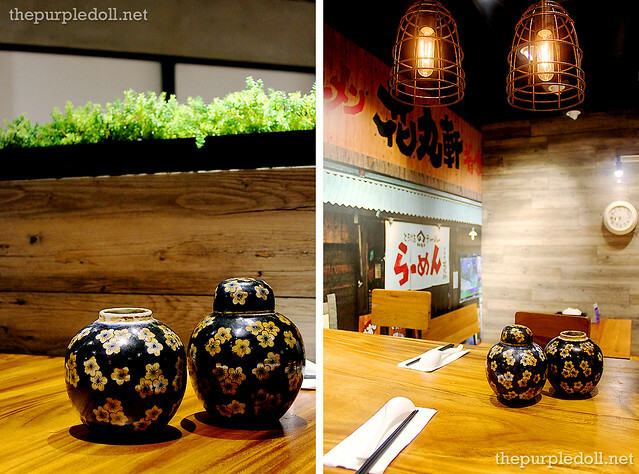 However, upon entering the restaurant, I felt giddy and excited because of how nicely the place is decorated! It's Japanese, but it's quirky. 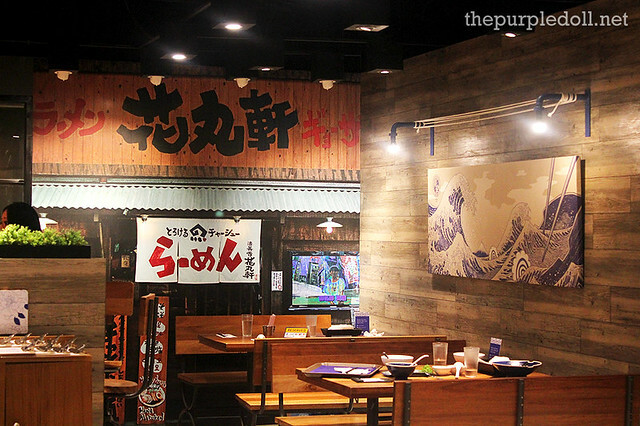 And you don't really see a lot of ramen joints which ooze of quirky, do you? 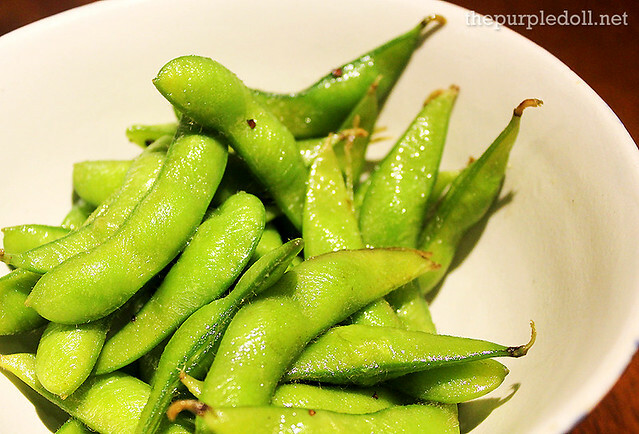 The first thing to arrive was the Edamame or young soybeans in pods. This is a traditional Japanese appetizer seasoned with just salt, but here, it was also drenched in chili oil which made it more addicting, albeit annoying for the hands because of the oil. 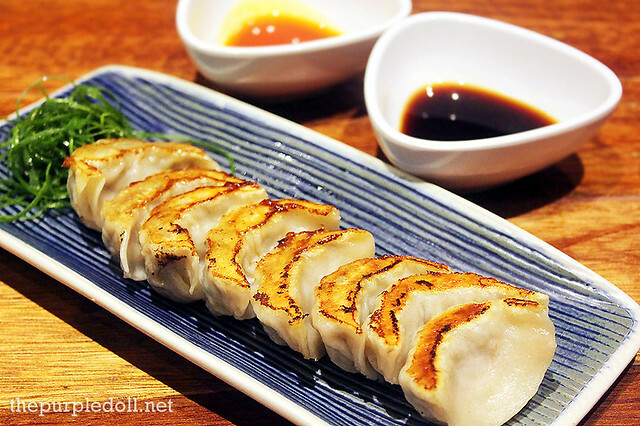 On a separate visit, the beau and I got to try the Gyoza which was unfortunately not available when we visited with our friends. It was pretty good, with one side pan-fried to a delicate crisp, and the other soft from steaming. The meat and veggie filling was tasty too, soft, juicy and succulent with just the right amount of savor. 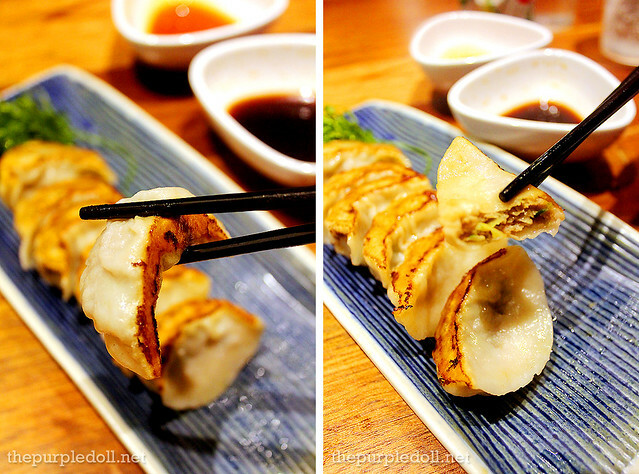 But of course, each piece tastes even better when dipped in the sauce and some chili oil. How can we miss the star of Hanamaruken? If you didn't know yet, this bowl of Signature Happiness Ramen is the main reason why Osaka locals queue at this ramen joint. 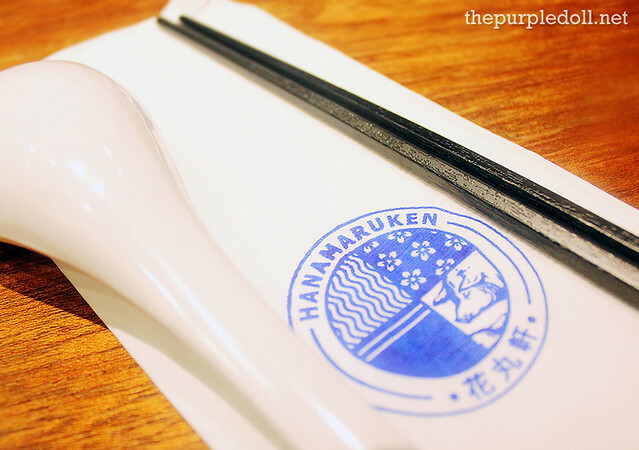 It's also the reason patrons of our Hanamaruken in Trinoma come back again and again. The secret? This bowl is made up of a shoyu-tonkotsu (soy sauce-pork bone broth) ramen topped with a dark, tender and slow-braised pork rib. Every sip of the broth has just the right amount of saltiness and savor that doesn't overpower the whole dish. The noodles are thinner than the norm too. But the superstar in this bowl is the braised pork rib which tastes really good even on its own. We also got to try the Curry Tan Tan Mien which is a different take on the normal tan tan mien. This tonkotsu-based ramen had the same thin "al dente" noodles, but with sesame paste and curry mixed in. To be honest, I was expecting the curry to take over the flavor profile. However, the curry was just a hint. With some sips, I didn't even taste it. I have a confession... This Pot Belly Ramen is my happiness in a bowl. Yup! The Signature Happiness Ramen is good, but my palate really jived with this variant instead. It also has a shoyu-tonkotsu base, but with roasted pork belly. 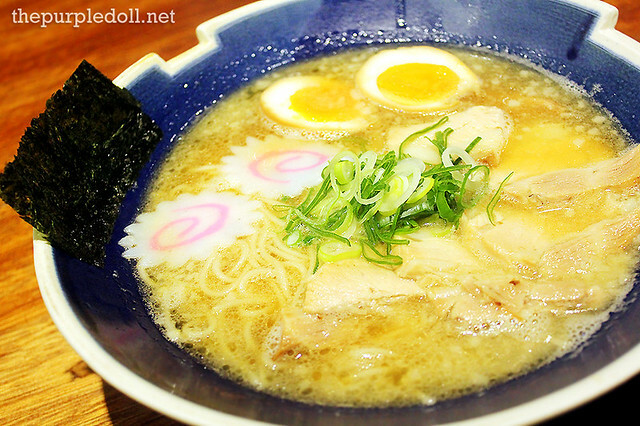 So what made me fall in love with this ramen? Apart from the broth and noodles, it's the slightly charred flavor of the pork belly that captured my heart. It was delicate (unlike the very flavorful pork rib in its Happiness sibling), yet quite bold when eaten with the noodles and broth. 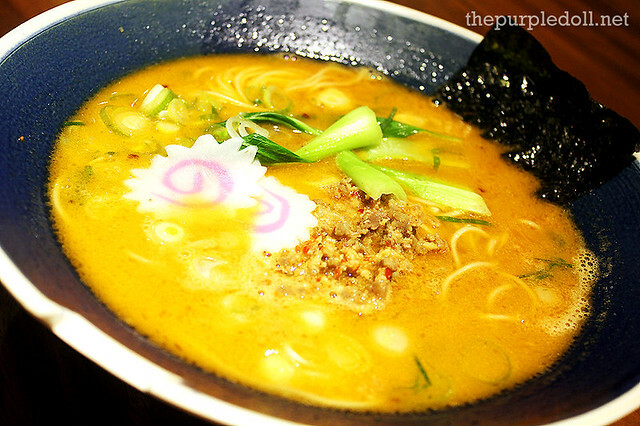 For the spicy food lovers, here's the Spicy Tobanjan Ramen with tonkotsu-based broth and tobanjan (spicy soybean) paste. It's as if Japan meets South Korean with this bowl of ramen. And as much as I love both Japanese and Korean cuisine, this was sadly my least favorite out of all the ramen variants as the meat in it was quite dry. On a separate visit, I got to try the Salary Man Ramen which has a shoyu-tonkotsu base and sliced pork shoulder. Since the meat in this is neither braised nor roasted, the whole bowl tastes more mellow than the other variants. It's simple and straight-forward, but still tastes pretty good. Perfect for those who prefers more subtle ramen. 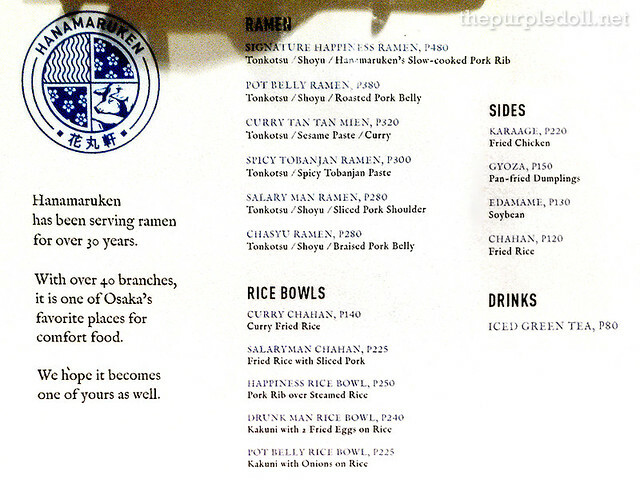 By the way, all the ramen variants don't come with Aji Tamago or Japanese marinated soft-boiled egg. 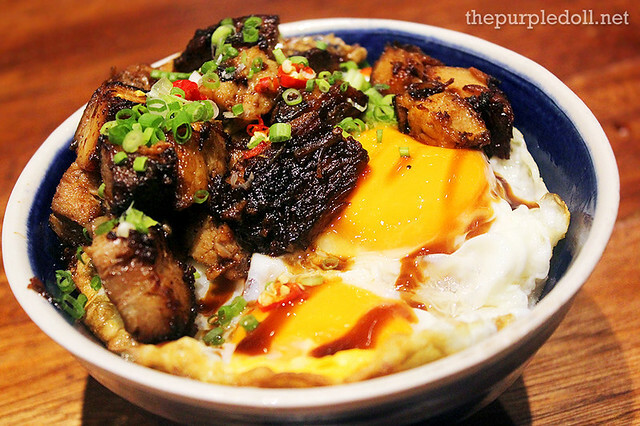 Apart from the Pot Belly Ramen that made me oh-so-happy with every mouthful, an item from the ramen joint's list of rice bowls also drove me bonkers. And it's this marvelous Drunk Man Rice Bowl! This has Japanese rice topped with sweet and savory kakuni (braised pork squares), green onions, some chilli, and 2 pieces of fried eggs. I don't know why they named it as such, but I sure got drunk out of happiness when eating this. This is definitely one of the best rice bowls I've ever had! Tender, succulent, flavorful, and calorie-loaded but so worth it! Even the beau really loves it too! I'm not sure if Hanamaruken Ramen now offers desserts. However, when we visited, there weren't anything sweet on the menu as theirs was very straight forward. Hanamaruken Ramen has proven to be a really good competitor in Manila's continuous battle for authentic Japanese ramen. While I'm still on the lookout for other authentic ramen houses in the metro, I definitely have my eye and palate on Hanamaruken for my happiness in a bowl. 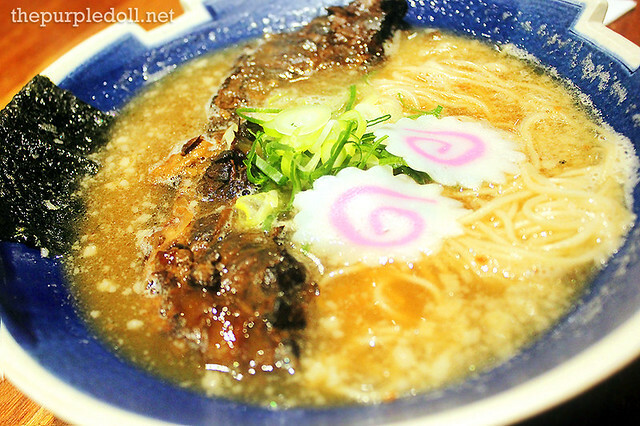 Its proximity to my place is a big plus too, since other ramen joints are usually over an hour away. And while I normally try and order other items on the a resto's menu, I think at Hanamaruken, I've already found my happy pills -- the Pot Belly Ramen and the amazing Drunk Man Rice Bowl! THis looks very delicious. I want to try.